Students, listen up. If you want to be educated consumers of your college costs, you have to read this blog! Congress brought out their knives and spears this year to fight over the interest rates you have to pay on your college loans. Those in favor of lower rates said they were coming to your rescue. Forget it. You are still sinking. To steal from James Carville's famous political line: "It's the principal, stupid!" It stands at $1.1 trillion (original principal plus capitalized). Even if you have an interest rate of zero percent, your debt burden could still be crushing because your principal -- the amount you borrowed to finance your education -- is so diabolical. The higher interest rates that you will face in the near future will just add insult to injury, the topping on a cake already too big to bite. Look at the table below. 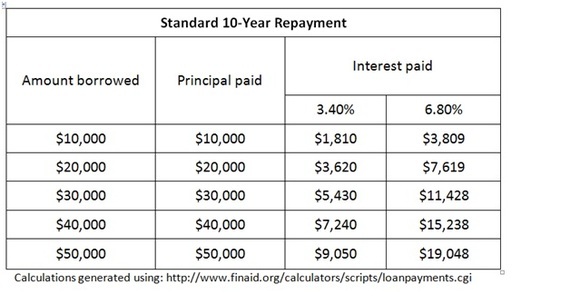 It shows that with the standard 10-year repayment plan, the principal is the bulk of your repayment, whether you double the interest rate or not. You shouldn't borrow more than about $20,000. Combined with interest, this amount obligates you to pay about $25,000. Believe me, with your job prospects, that's a lot of money. One way to get interest to matter more than principal is to just make the principal smaller by forgiving it. Or you can make interest bigger by extending your repayment time. The government does both of these things with an income-based option called the Pay as You Earn Repayment plan (PAYER). I bet you didn't know about this. If you can stand to pay your loan for 20 years instead of the normal 10, this might be a good option for you. You will never pay more than 10 percent of your annual income and will get lots of forgiveness at the end of 20 years, or your death, whichever comes sooner. There are multiple options like this and it is worth your time to look into them. Confused? Sorry, there is no better way to make you an informed consumer than by dishing the facts. With student loans becoming almost as complex as the tax code, it is a shame you didn't study student loans in high school math classes. Truth be told, each one of you should have to prove you understand how student loans work before you can get one. After all, without a license you can't drive a car out of the showroom, but the government will give you an educational loan whether you understand them or not, and then hire a collection agency to pursue you like a dog if you default. So here is your short course on student loans: principal is at the core. A simple banking rule has always been, don't borrow more principal than you can repay. That's not about risk or fear or ambition. It's just simple financial logic. So think hard about which college you choose and how you are going to pay for it. Keep the principal low and you'll be happier in the long run. Good luck!